Soak kambu, Black gram dhal and Fenugreek seeds in water for 6 – 8 hours. Goes well with: All kinds of chutneys. 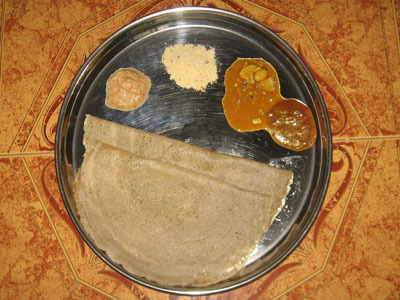 Tips: For Sweet Kambu Dosa add Jaggery(vellam) instead of Salt. Make sure that Jaggery melted well with the batter. Spread the Grated coconut on one side when u make dosa.